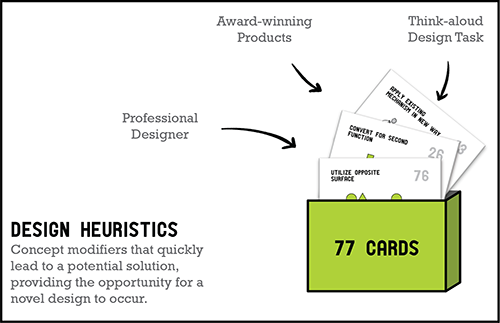 The 77 Design Heuristics cards have been used in a variety of courses: – Introduction to Engineering – Capstone Engineering – Product Design – Design and Manufacturing – Introduction to Industrial Design – Creative Process – Industrial Design Studio. They have also been successfully used by engineering and design practitioners in a two-day workshop setting. Download the slides to teach the 77 Cards: Design Heuristics in your classroom! Download the slides to teach Design Heuristics as lateral and vertical transformations of previous ideas.